Updated on August 11, 2016 to share component beers and blending percentages.Updated on November 1, 2016 to announce release dates.Our collaboration series of beers has allowed us to work (and drink) with some of our favorite people in the beer industry who brew fantastic beers. We’ve been lucky enough to brew with Jean-Marie Rock from Orval, Larry Sidor and Deschutes Brewing Company, Dann and Martha of Pretty Things Beer & Ale Project, our sister brewery, Phil Leinhart and Brewery Ommegang and most recently with Cigar City Brewing’s Wayne Wambles. We’ve held the beers of Firestone Walker’s Brewmaster Matt Brynildson in very high regard for many years. When we learned that Firestone Walker would be joining the Duvel Moortgat family of breweries, we immediately knew who we wanted our Collaboration No. 6 partner to be. Firestone Walker has a tradition of inviting local winemaking friends into their brewery each year to collaborate on a blending project that results in their anniversary ale. Pulling from several barrel-aged beers, they tinker with different blending percentages to create an incredibly complex, yet unique beer. 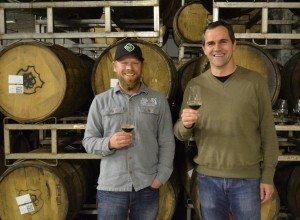 In this spirit, we invited Matt Brynildson into our barrel-aging cave to taste beers with Boulevard Brewmaster Steven Pauwels. Armed with their palates, some graduated cylinders, nearly two dozen tulip glasses and a few bottles of Firestone Walker’s barrel-aged beers, they spent the afternoon tinkering with different blending percentages before finally deciding on just the right blend. Brewed with Belgian candi sugar and aged in a selection of ﬁne bourbon barrels, Stickee Monkee trailblazes its own category as a “Central Coast Quad.” The name Stickee Monkee is a nod to the Central Coast’s native Sticky Monkey ﬂower, as well as a shout­‐out to the Belgian monks who pioneered the Quad style. The Belgian candi sugar imparts a signature molasses sweetness to the beer. Meanwhile, maturation in bourbon casks brings ample barrel expression with notes of toasted oak, coconut, leather and cigar tobacco. Our special treat for lovers of big, complex stouts, the Imperial Stout "X" series offers a year-long roster of limited releases, each with a significant variation. This riff spotlights the addition of tart cherries to fermentation as well as a lactic souring on the brewhouse. The result is a perfect marriage of robust, smoky maltiness and bracing tartness. Unlike the release version of Imperial Stout X – Tart Cherry, this portion was briefly aged in previously used whiskey barrels. Collaboration No. 6 - Barrel-Aged Blend will be released starting in the Greater Kansas City Area on November 7th (draft) and November 8th (750 mL bottles) and will be sold through Boulevard's distribution network. Areas that normally see Smokestack Series limited release beers like Saison-Brett or Rye-on-Rye should expect to see Collaboration No. 6 in the coming weeks. Please note that we do not have access to our distributors' delivery schedules and will be unable to confirm when Collaboration No. 6 - Barrel-Aged Blend is available near you. Additionally, we are only able to confirm release dates in the Greater Kansas City Area.